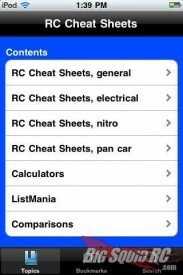 And here’s another App « Big Squid RC – RC Car and Truck News, Reviews, Videos, and More! So what is this “iPhone” thing everybody is talking about? And why does everybody want to create an “app” for it? 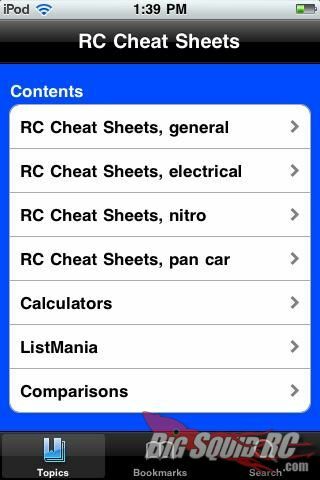 Team Associated is also jumping on the “bandwagon” with their recently released “RC Cheat Sheets” “app”. With this app you can keep track of “vehicle setups”. It’s useful for electric and “nitro powered” off-road, on-road, oval, “and” pan car style cars and trucks. It also “includes a number of” other tools such as: a lap “counter”, rollout/gear “ratio” calculator, unit converter, “drill” size chart, and an important “Common mistakes for beginners” help guide. Being a “Team” Associated product, “the” Cheat Sheets app comes preloaded “with” all of the A team’s popular vehicles. You can get the app from the “iTunes” “App” “Store” for “only” $2.99. Check out the Team Associated web site for more info.